SIM Horse Racing is a free text-based browser game with virtual horse races. You can buy horses and also bid on horses at auction. A horse needs to be at least two years old to breed. There are lots of different tracks and you can race your horse at any track. Don’t forget that shipping a horse around the world takes time so you have to make sure that your horse will arrive at the destination by race time. You can create a horse, build a farm, create a race, lease horses and keep an eye on the financial summary. 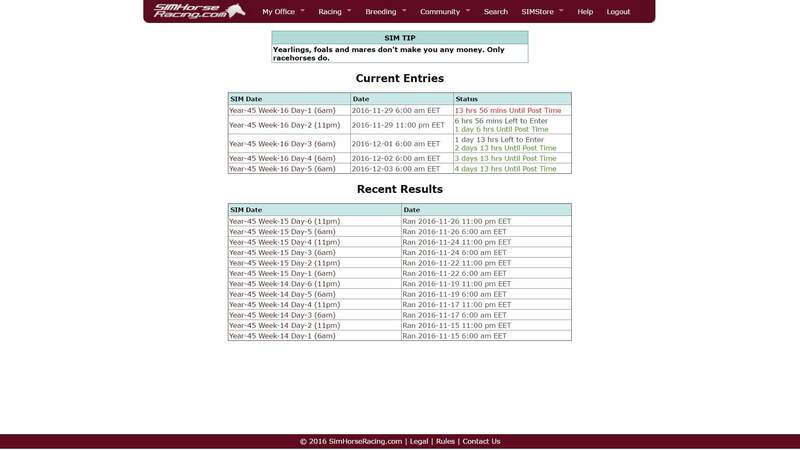 Visit SIM Horse Racing website! Love this game. I’ve been playing for about 4 years now and I have to say it is not a game you are going to jump right into and compete with the top players. It will take time, and a lot of patience. But it is such a thrill to log on to watch the races and seeing your horse cross that finish line first. This game deals with all different aspects of horse racing, from the training, to getting the equipment correct, finding a jockey, breeding and selling. This is truly a fantastic horse racing simulation. I have played pretty much every horse racing game on the internet, and this is the only one that has kept my interest. It is the most user friendly, has the best community, and is by FAR the MOST fun! If you like horses, or horse racing, do yourself the ultimate favor and join the game <3 It's 100% FREE! I’ve played most of the online horse racing games and this is by far the best. No other game compares with the complexity and realism of Simhorseracing. Breed, buy, sell, train and race your horse and then enjoy the disappointments and euphoria as your horse runs a poor race or surprises you with a big race win. Non stop fun whether you’re racing horses over flat or jumps and if you get a decent horse then there are big races at the end of the season to look forward to. I’ve been playing SIMhorseracing.com for over 8 years now, no other Internet game has held my interest for this amount of time. The very best thing is it is totally FREE to play. You have your own stable and barns, you can race Thorougbreds, Steeplechasers, Appaloosa’s, Quarter Horses, Paints, Trotters, Pacers and Arabians. There are races every day except Sundays. You equip and train your horses to run their very best. Lots of Graded and listed stakes. Steward Cup races at the end of each year for the Best of the Best. You are breeder, owner, trainer and every single horse has its own attributes and failings. Thanks to a random factor (just like real life) you can never be sure how each race will play out or what breeding will give you a Superstar or a claimer. By far the most interesting and challenging game I’ve ever come across. The most realistic horse racing game you will find. One of the most in-depth sports simulations you will ever find. Covers the whole gamut of horse racing. Breed foals, train them as yearlings and 2-year-olds, race them, buy them in claiming races, sales and auctions, then retire them to start the breeding cycle again. Thoroughbred, Quarter Horse, Standardbred, Arabian, Appaloosa and Paint divisions. If you enjoy horse racing, you will LOVE this game!